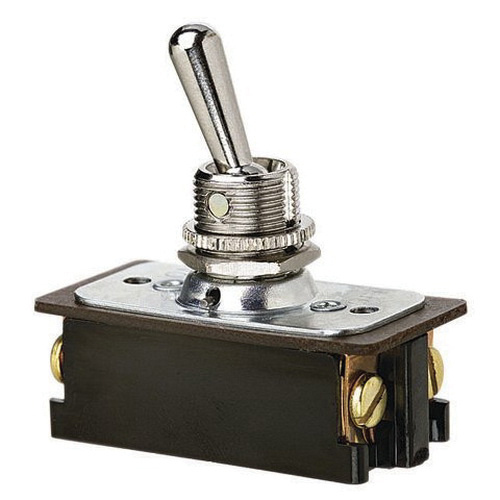 Ideal Industries 2-Pole AC/DC bat toggle switch is rated at 125/277-Volts and 16-Amps at 125-Volts/8-Amps at 277-Volts. This ON-OFF maintained switch with DPDT contact configuration, features sturdy metal construction. It has a dimension of 1.75-Inch x.08-Inch x 0.76-Inch. Switch with screw terminal connection, has maximum load capacity of 1 hp at 125 - 250-Volts. Switch with screw terminal connection, is ideal for DC voltage applications and industrial motor control. Switch is UL listed and CSA/RU certified.